Can you believe it’s almost Thanksgiving? There are three turkeys that live down the street from us, and it seems to me like they have uncanny knowledge about what happens in November, because they always seem to disappear this time of year. I can’t blame them though, if I had to choose between holiday madness and hiding from the world for a few weeks, it’s not hard to decide which one I’d go for! 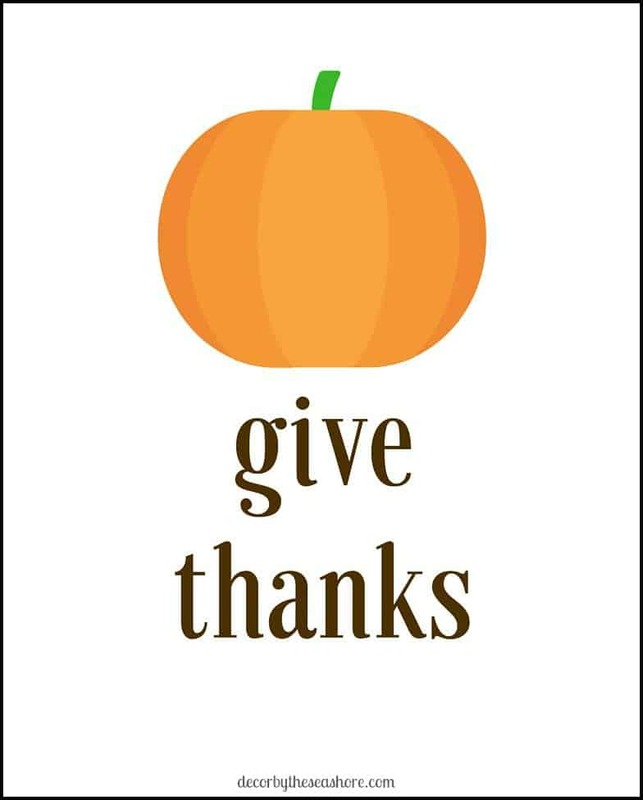 I’ve made three Thanksgiving printables for you to use to decorate your home. Now let me prepare you, as these are just all around fabulous, and you won’t be able to find printables like these just anywhere on the internet! And the best part is, you don’t have to choose just one, you can use them all! It’s like going on a shopping spree and getting to take everything home for free! I used a white background for all of the printables because I LOVE free printables but boy do I hate when the backgrounds are colored because it DESTROYS my ink cartridge! So this way you can choose to stick with the white background or mix it up with some colored or patterned paper. They are all sized for an 8×10 frame. And as if that wasn’t enough, I have also included a few links to even more Thanksgiving printables at the bottom, just in case you need them. I mean, I can never get enough free printables, can you? Click below to download your free Thanksgiving printables! You know, only one of the most important staples of Thanksgiving dinner… turkey, pie, and stretchy pants! If you forget those stretchy pants, you’ll regret it later! Because let’s face it, pie is only the most important part of the whole deal. We’re not even gonna talk about the time that my mom and I had wine and pie BEFORE Christmas dinner. Self control is so overrated around the holidays! I figured I’d tone it down a little and create a more “classic” Thanksgiving printable with this one. It’s simple and lovely and beautiful, what more could you want? 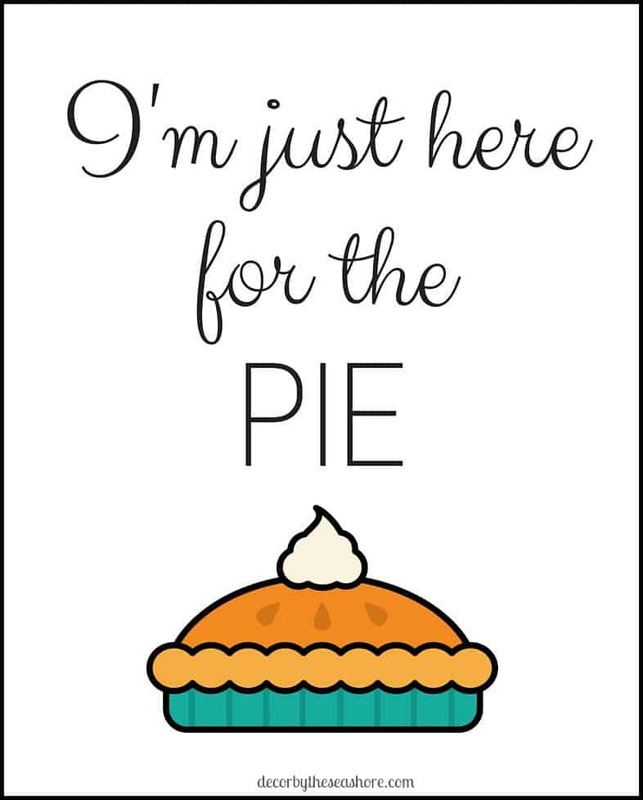 Even More Free Thanksgiving Printables! Just in case your thirst for free Thanksgiving printables is not yet quenched (though, let’s face it, these are some pretty fabulous printables I cooked up), I have also included a few links to even more free Thanksgiving printables. Can anyone say Thanksgiving printable overload? 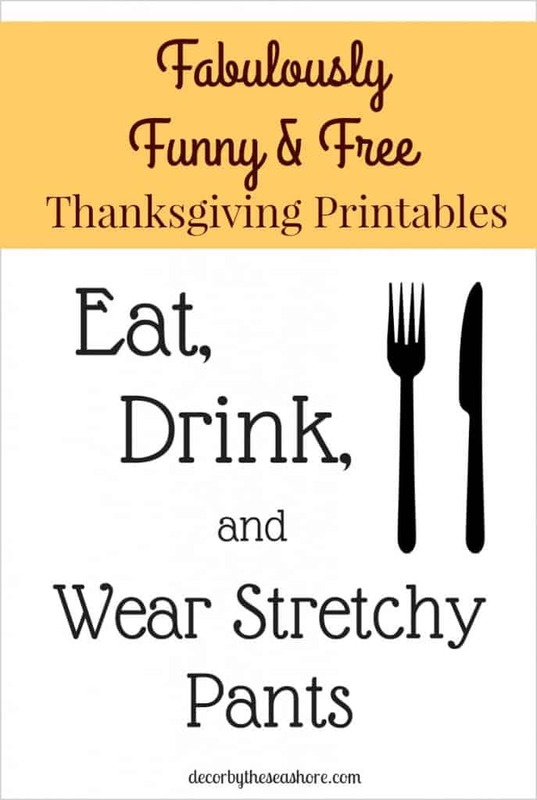 16 Free & Fantastic Thanksgiving Printables from Snap! If this doesn’t give you your Thanksgiving printable fix, I don’t know what will! You can also follow me on social media, as I am always posting free printables and DIY crafts! Let me know what printables you chose to use for your decor in the comments! These are adorable and have a great sense of humor about them! They’re pinned and tweeted! So cute and such a great sense of humor! After all, after we give thanks, we are all about the food, and loosening the belt buckles to eat all that yummy food. Thanks, Mary! I thought I’d break away from the more “traditional” Thanksgiving prints and go with something a bit more humorous. Who couldn’t use a good laugh this time of year? These are adorable! You know we will be busting out the stretchy pants on Thanksgiving. Thanks for sharing! Thanks! Haha that is so true! Glad you enjoyed it! Beautiful printables!! Thank you for offering those and for linking up to my DIY Crush party! I pinned it as well! Can’t wait to see what you will link up Thursday!! Thanks so much, Denise! I will be sure to stop by again this week! Ahhh I love your sense of humor. 🙂 If you felt like it, I would love to have you come by this weekend and link up at the Friday Frivolity blog party I host! Found you via Thriving on Thursday. 🙂 Thanks for sharing your talent with us! Thank you! I have added you to my list and will be sure to stop by! These are adorable printables. Stopping by from SITS Blogging and hope you’ll link up with us at Small Victories Sunday Linkup too, it just went live for this week. Thank you! I will be sure to stop by your link party! Wine and pie before dinner?? Sounds like an awesome plan to me! Thanks! Haha it was a fun Christmas indeed! My favorite is DEFINITELY the stretchy pants, I know the bloated feeling. I’d love to print these and put them up in my home for Thanksgiving…I may bring it as a hostess gift for my friend who’s making the dinner this year. Love! Thanks again for sharing all your awesome posts at Welcome Home Wednesday. That’s a great idea for a hostess gift! I’m sure she will appreciate the humor! Thank you so much for these – a touch of humour brightens any day, including Thanksgiving. Will definitely be wearing those pants. Great blog too, btw. That is so true. It’s important to have a good sense of humor… it makes everything much more fun! 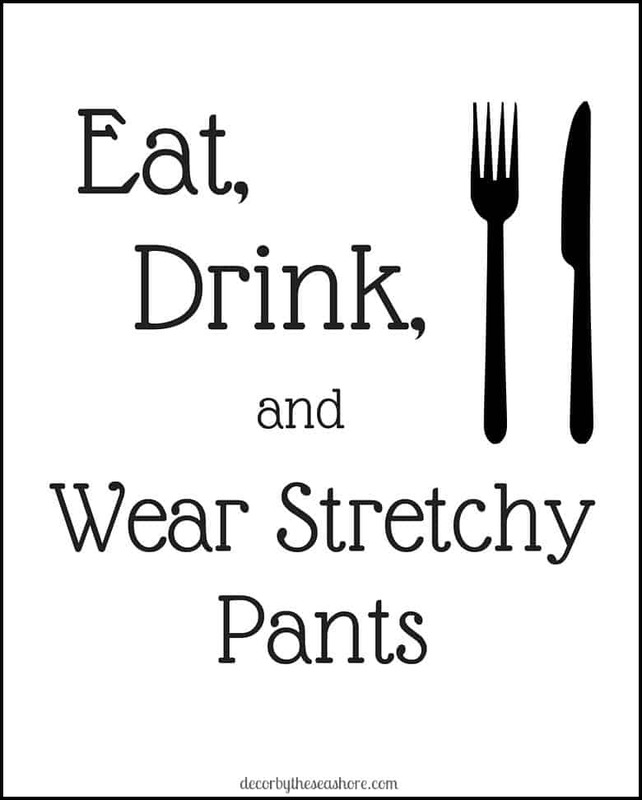 And I will definitely be sporting the stretchy pants, as well. Thanks for checking out my blog! LOL. Love that first one. Awesome prints! Love the one about pie, that pretty much describes me. Haha, of course, the pie is the BEST part! Haha, eatin’ pants… love it! Love the stretchy pants! So true, isn’t it? Thanks for linking up with us at Funtastic Friday. Hope to see you again this week. Thanks! Too true, right? I will be back for your next link up for sure!